Hope County Stories is a series of board games, each with it’s own unique and exciting theme, which all use the same game board and feature a cast of characters from the community. 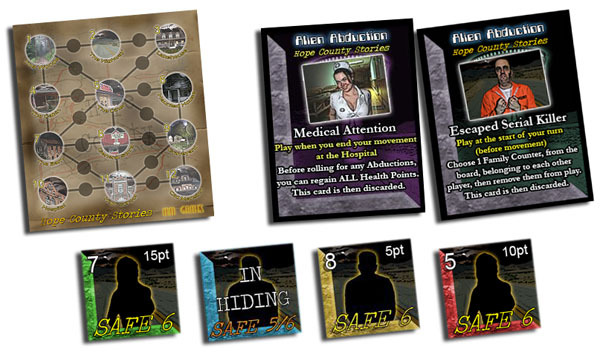 Although using the same game board and characters, each different game (or story) will provide it’s own set of rules, game cards, tokens and variations on game play. As more Stories are introduced, you will follow the inhabitants of Hope County as they face all manner of threats to their very existence; whether it is a horde of Zombies, an evil blood sucking Vampire, an Alien Spaceship trying to abduct innocent townsfolk, or even rampaging Werewolves. Those players who have played Night of the Bloodsuckers 2nd Edition, or Night of the Slasher, may already be familiar with the people and places of Hope County. In the first of this series of games, players will race around Hope County trying to save members of their family from being abducted by the mysterious Alien ship which has appeared over the town! 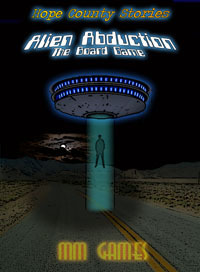 The Alien Abduction Game Files (all in PDF Format) include the game board and all the game cards, tokens and playing pieces required to play.